The Preliminary examination of Officer in NABARD Grade ‘B’ Exam 2017 in successfully held on 6 August, 2017. 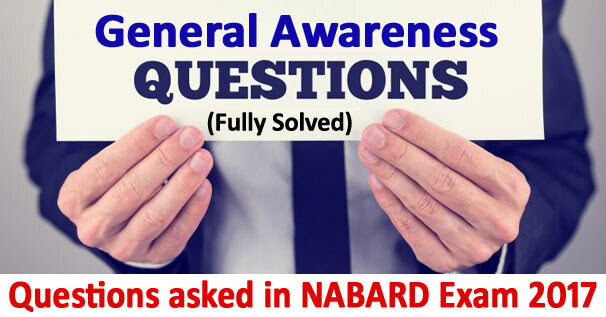 Here are some General Awareness questions asked in the examination. 1. The 750 MW Rewa Ultra Mega Solar Plant is located in which of the following states ? 3. The 'Malabar' is a naval exercise between which of the following countries? 5. Where is Indian Institute of Rice Research located? 6. Which government had grant residential allotment letters to homeless people in the marked habitation areas of Gram Panchayats? 8. Where is the National Institute of Diabetes and Digestive and Kidney Diseases headquartered ? 9. Nagpur is situated on the bank of which river? 10. The Y-20 aircraft is a large military transport aircraft of which of the following countries? 12. China is establishing its first overseas military base in which of the following African Countries? 13. The 43rd G7 summit was held in which of the following Countries? 14. Which of the following railway schemes will give wait listed passengers berths in other trains at no extra cost? 15. The 'NAFTA' is an agreement signed by various countries creating a trilateral trade bloc. What does 'N: stand for in 'NAFTA' ? 16. International Youth Day is an awareness day to draw attention to a given set of cultural and legal issues surrounding youth. What is the theme of this year's 'International Youth Day' ? 17. Which of the following is the first Indian City to get UNESCO heritage tag? 18. Which of the following is the first woman cricketer who scored 6000 runs in ODIs ? 21. Which of the following is the currency of the Democratic Republic of Congo?